There are several important things to do in the aftermath of having a bike smash. Cyclists can use this help guide to understand what is the first thing to do in the event of a cycling accident. BIKE CRASH! Any involvement in a cycling crash will be a shock. You may have an injury, a mangled bike, and scattered belongings in the road. But, knowing what to do straight away can make the recovery a lot simpler in the days and weeks after having a cycling accident. These figures represent the number of pedal cycle casualties reported to the police in Great Britain during 2017. The data on bike crashes comes from the Office for National Statistics. Note: Statistics show people aged between 16 and 59 are in the most vulnerable age group for bike accidents in the United Kingdom. If you get tumbled from your bicycle, your first priority should be getting out of harm's way. Shout or wave to try and attract attention if you are unable to get to a safe spot by yourself. Check the safety of others if you collided with a pedestrian or another cyclist. Consider helping them to move out of the way of traffic if they cannot get to safety by themselves. Always call 999 to get an ambulance if anyone has a serious injury (including yourself). Calling the police as well means they will have logged the call. It could prove to be useful evidence at a later date. Note: Do not move anyone if they could have a neck or back injury. Follow the DRABC first aid procedures for roadside emergencies instead. According to UK driving rules, drivers must supply their details to anyone they collide with. Do not delay getting registration numbers of all vehicles involved. Try to get a record of the make, model, and the colour as well. Note: There is no legal requirement for other cyclists or pedestrians to supply their details after a collision. It's not always the first thing to do after a cycling accident. But, check if there are any independent witnesses who saw the crash. You could ask someone else to collect contact details for you if you have an injury. Try to get names, addresses, and phone numbers. You may not think of sketching diagrams if a car hits you on your bike. But, rough sketches with measurements can be very useful if you cannot take photos. The first thing to do after a bike crash is not apportioning blame for the accident. But, there are ways to help you identify the main culprits. For example, make a note of any signage or livery on HGVs or large vehicles. It is not uncommon for cyclists to carry a smart phone with them, even while cycling. If so, take as many shots of the incident that you can (especially drivers' faces and number plates). Other useful photographic or video data can include kerbs, drains, and potholes. Try to get pictures of any parked cars, painted road lines, lamp posts, and vehicle skid marks. Note: Remember to sign and date (with a time) your account of the incident and keep it safe. Store any head cam footage and check if any of the vehicles involved had a dash cam running. You might find it tempting to continue the journey if your injuries are slight. But, there is no replacement for a full hospital check-up after a road crash. Always seek medical attention for any injuries that are slow to heal up. Cyclists Highway Code | Rules 59 to 71 is essential reading for everyone who rides a pedal bicycle. Vulnerable Road Users | Highway Code rules 204 to 225 address situations requiring extra care. Do your best to get close-up pictures of the damaged bike and any belongings. They could prove to be invaluable for any potential compensation claims. Remember to keep all receipts for any bike repairs you pay for. Note: In most cases, you should replace the helmet if you were wearing one and you got a bump on the head. You might need to get legal assistance if you suffered personal injuries. Remember, membership with a cycling organisation can provide you with free help. 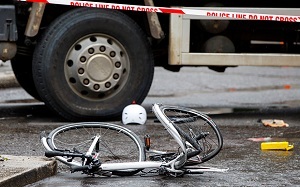 They will be able to offer you access to UK lawyers knowledgeable in cycling incidents.